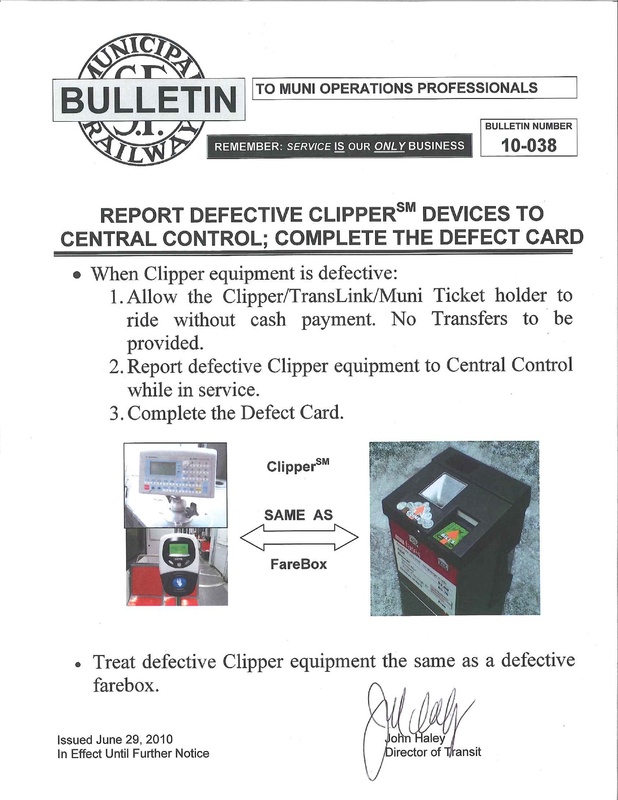 Back in July 2010, we reported on official SFMTA policy for when a Clipper reader onboard a Muni vehicle is broken: the vehicle’s operator had to allow passengers with Clipper cards to board. We even posted the official memo from SFMTA for you to print out and carry with (much as it made our stomachs turn to encourage dead-tree-ism). The policy has not changed. Any customer who receives a citation that they feel is unwarranted may certainly protest the citation. Here is a link from our website to the page about paying or protesting a transit fare citation: http://www.sfmta.com/cms/mfares/AdultMunitransitviolationonorafterFebruary42008.htm. We appreciate customers alerting us to malfunctioning Clipper readers via 311. So, when you encounter a broken Clipper reader, insist on boarding the vehicle. Protest a citation if you receive one, using the guidelines in the link above. It’s probably a good idea to note the coach number, the driver number, and the date and time for reference. The more you know, and all that. A year ago I was taking MUNI to CCSF for a math class and that reader was broke 50% of the time. Clipper turned out to be way cheaper than a fast pass. I haven’t had a problem on any bus lately, but sometimes when I board the T or N at Caltrain, I have to wade through the car to see if one of the other readers is working. It is very annoying when it is crowded. In the unlikely event that you find the Clipper system in a state that resembles “working,” bring a big hammer and break the machines yourself. Problem solved.